As a cadet progresses through the ROTC program, their responsibilities become greater and greater. For example, freshmen start by learning basic Army customs and courtesies, Army terminology, and Army Drill and Ceremony; much like a Private in the Military. Sophomores will become Team Leaders in charge of a small group of Freshmen and Sophomores, making sure they get all the information they need for lab and Physical Training (PT); much like a Specialist or a Sergeant. The Junior will be in charge of a larger group of people organized into platoons. With the help of the other Juniors, they will run the platoons through PT in the mornings, Lab in the afternoons, and checking up on them throughout the week; they will be the Platoon Sergeants and Leaders, Company Commanders and First Sergeants in the Army. Seniors will be in charge of the training and overseeing of the platoons and the training. They will develop training plans for PT and Lab with the help of cadre and their fellow peers; they are the Majors and Captains that run Battalion-level activities in the Army. The ROTC course is divided into two parts; the classroom and the lab. In class, cadets learn leadership and military skills from Cadre who have many years in the military and provide cadets vignettes to further strengthen the classroom material with their own experiences. During lab, cadets wear the ACU camouflage uniform (provided by ROTC) and practice their leadership and military skills in the woods around UNC Charlotte. During this time, they will conduct Squad Training Exercises (STX) where a Junior leads a tactical mission, such as a knock out a bunker mission. Using the skills the Junior has been taught in class and his previous years, he or she will lead a squad, around nine people composed of fellow Juniors, and complete the mission going through the military process taught in class. The Sophomores and Freshmen perform basic Army tactical training from learning Land Navigation to moving strategically through the woods to basic tactics and walkthroughs. 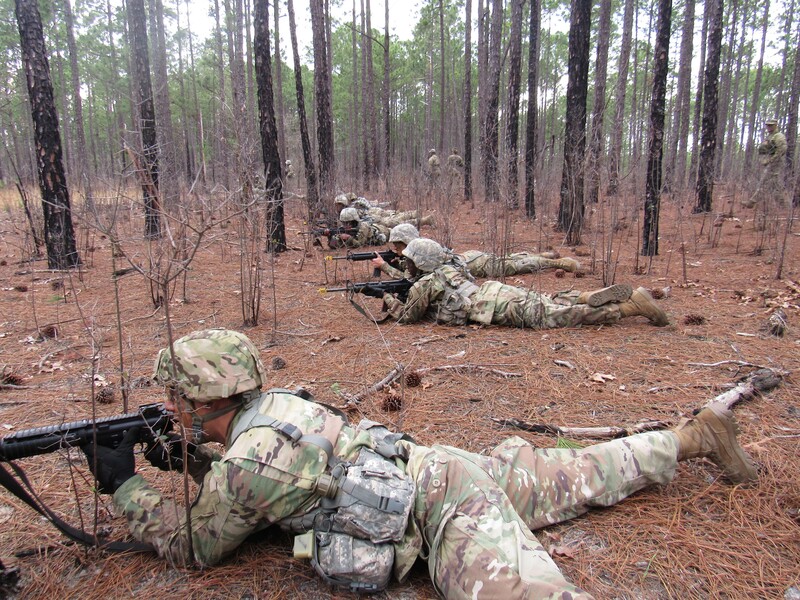 One weekend every semester the ROTC Program conducts a Field Training Exercise (FTX) at Fort Jackson, SC to allow cadets more intensive training with a larger group of people. For the weekend, cadets are put through various training events like Rifle Training where they are taught how to fire and clean an M16, to testing their Land Navigation skills on the Ft. Jackson course, to Rappelling, eating in an Army Dining Facility, and other training so the cadet can experience different training not available on the UNC Charlotte Campus. Above all, an Army ROTC cadet is a student. A cadet's first priority is always with classes and to complete their degree. One advantage ROTC students enjoy over their military academy colleagues is they receive a traditional college experience. Cadets’ lives aren't that dissimilar from other college students; they take jobs at local businesses, join fraternities, and even perform community service. Cadets learn discipline through managing their daily life, not through strict institutionalization. Join us and enjoy it!